I use many different methods to create my sculptures, and I enjoy the challenge of mastering a new technique. Clay has the ability to record everything that you do to it, and so a clay sculpture contains a complete record of the creative process. Every finger print, every change of mind and every aspect of the methods used is visible, and so it is important to keep things fresh and spontaneous, as indecisions can appear clumsy. There are countless techniques and approaches when it comes to sculpting. I enjoy trying new techniques, and its possible that I will never settle on one particular style or method. When sculpting I initially try to view the piece as a collection of shapes and curves, and mentally detach it from its subject matter. I occasionally take this process a stage further, and create an abstract sculpture. My primary technique when constructing a clay one-off sculpture is to work with a sheet of clay that is bent and shaped to form the body of the piece. 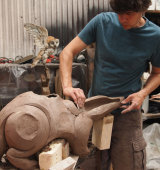 Usually one hand works inside the hollow form, and the other outside, and so access holes need to be left open until the piece is near completion. My clay sculptures are fired to 1230 C and glazed with a wash of metal oxides and a satin feldspar based glaze. As they are stoneware sculptures they will survive a life outdoors. Constructing with wire is a quick and intuitive method of sketching in 3 dimensions. I love this method, and I use it when I'm making something that is to be molded and cast in another medium. Many sculptors just work with wire and the frame becomes a piece in its own right, and I have often regretted fleshing out a wire sculpture. There’s something very appealing about these initial 3D sketches. There is no right way to do it, but the larger the piece the thicker the wire that you need to support it. Wire frames can be stitched together using a thinner gauge wire, brazed/welded or glued with resin. The basic 'lost wax' method of bronze casting is thousands of years old, and involves the creation a wax piece surrounded by sand or ceramic. Red hot liquid bronze is poured into a funnel, vaporizing the wax and filling the mould. Bronze casting requires a great deal of time, patience and skill, and is therefore an expensive process. Bronze-resin uses a mixture of polyester resin and bronze powder that is poured or painted onto a silicone rubber mould. The resin is usually strengthened with fibre-glass. A good bronze-resin will look like bronze, but it will not have the same feel and strength.